Highway 26: Last Chance to weigh in! 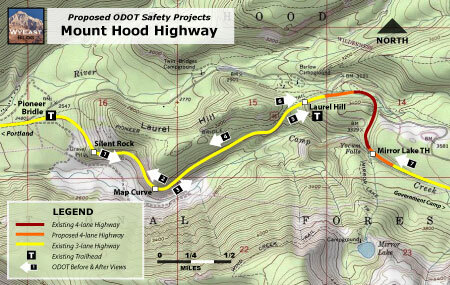 After several years of planning, the proposed safety projects on the Mount Hood Highway (Highway 26) are nearly a done deal, and have entered a final round of public review and comment — with comments due April 7th! The project has been the subject of several articles on this blog, and thankfully, has been scaled-back somewhat from the original, old school “widen for safety” retread of 1950s highway mentality that dominated earlier phases in the corridor. That said, the project has simply moved from a failed grade to something like a C-minus, at best. It needs your input to be more than an eyesore for the traveling public. The highway section in question is the Laurel Hill grade, west of Government Camp. 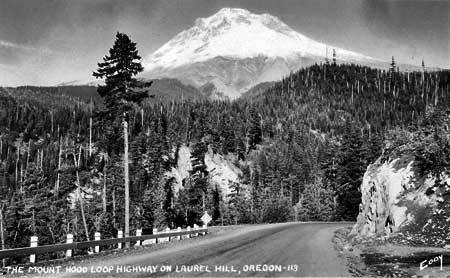 Ever since Oregon Trial pioneers lowered their covered wagons down the infamous talus “chute” on Laurel Hill, this spot has vexed road designers. The current highway alignment is no exception: despite blasting away a good portion of Laurel Hill, the road is still a steep, curving, often treacherous route. The need for safety improvements is on the mark, but it’s unclear if the solutions proposed by the Oregon Department of Transportation (ODOT) will deliver, as some of the best (and least expensive) recommendations from their own safety study were dropped from the project at the very start. It’s not to late to add some of these more practical, potentially more effective solutions to the project, even if the highway engineers seem determined to widen the road and chip away more of Laurel Hill as their preferred solution. More on how you can weigh in at the conclusion of this article. But first, an overview of the ODOT final proposal is in order, starting with kudos to the agency (yes, you read that right!) for greatly improving their public involvement. Having reviewed a lot of ODOT projects over the years, I’m impressed with the effort the agency has made in this final round of outreach for Highway 26. Though in-person open houses have continued to be limited to the Welches area (despite the fact that the vast majority of highway users — and taxpayers — live in the metro area), the web tools provided by ODOT in this round of public review are especially well done, and arguably a better format for most citizens than traditional open houses. 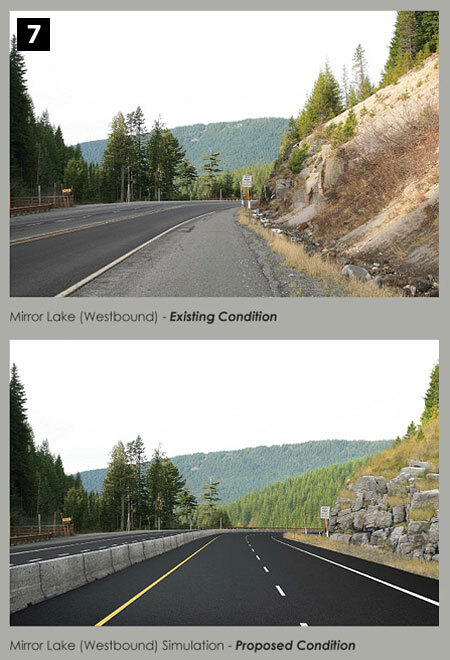 The following are “before-and-after” digital renderings of the major elements of the Highway 26 safety project. A link to the ODOT virtual open house is included at the end of this article, and includes these renderings at much larger scale. The number shown on each pair of images corresponds to the map shown above (or you can click here to open a large version of the map in a new window or tab). The tour starts from the west, at the base of the Laurel Hill grade, and proceeds east toward Government Camp. The project begins at the west (lower) end of the Laurel Hill grade. 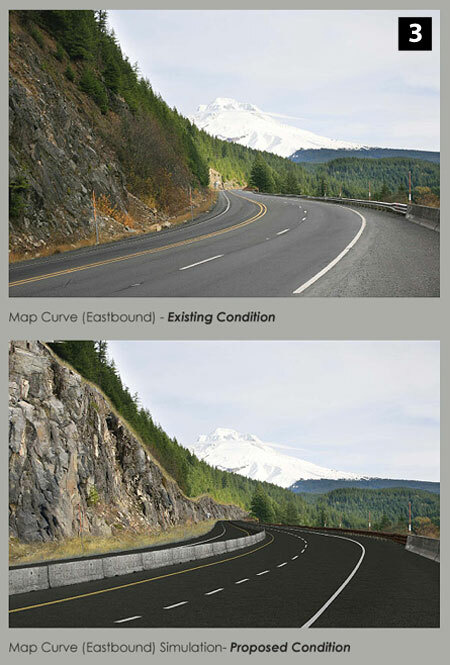 A number of small changes are proposed along this approach, but the most notable is proposal to cut back the cliff at the “Map Curve”, the ODOT name for the wide bend in the highway where Mount Hood first looms into view — a very popular, if somewhat harrowing pullout for visitors. 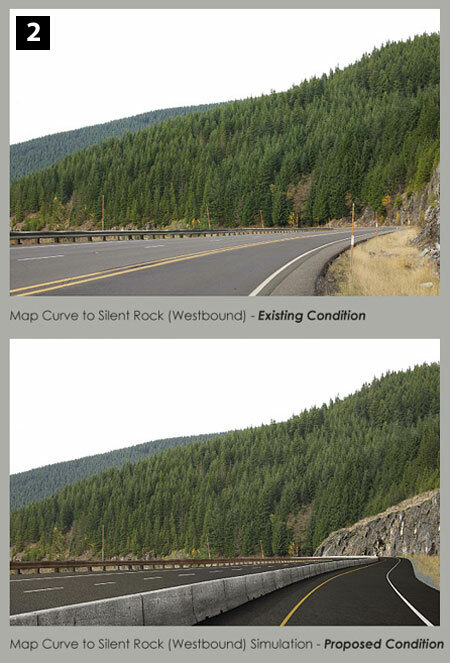 The rendering above shows what the scaled-back cliff at the Map Curve would look like from the west, as you pass the familiar road cut and rock outcrop known by ODOT as “Silent Rock. As the renderings show, the scaled-back cliff would be a major undertaking. 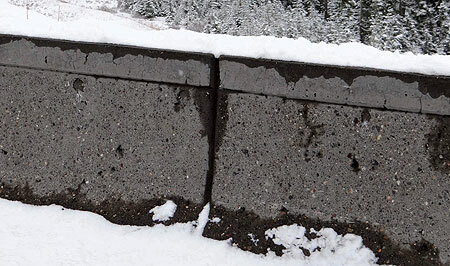 The purpose of this element of the project is to prevent rocks from falling on the highway. According to ODOT, this is safety concern in the area, and the cause of numerous crashes over the years. This is another before-and-after rendering of the scaled-back cliff, this time looking west from near the Map Curve toward the base of Laurel Hill. This view shows another proposed feature: a continuous concrete median, extending from just below the Map Curve to just above the Mirror Lake trailhead, for a total of about 2.5 miles. Unfortunately, the design pictured in the ODOT before-and-after renderings, omit the faux cap, greatly diminishing the “aesthetic” qualities of the proposed barriers. The cost of aesthetic medians will be a major driver in the ODOT final decision, but the longevity of the medians (30-40 years?) call for getting it right the first time. 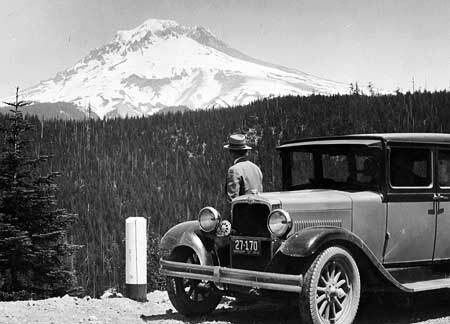 ODOT should be installing something special that truly enhances the Mount Hood Highway experience, not just something “less worse” than a standard freeway barricade. 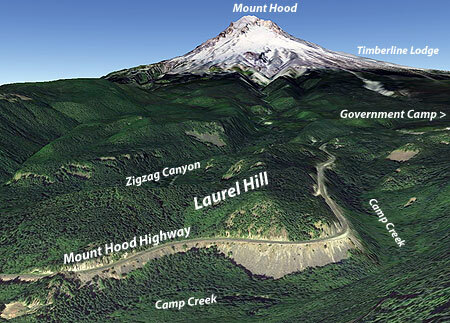 The next rendering (below) is from the Map Curve, this time looking east toward Mount Hood. 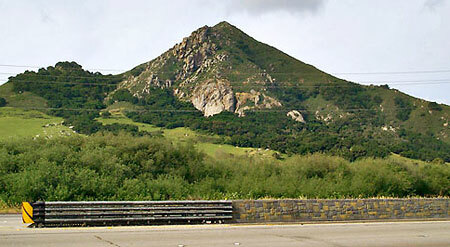 This view also shows the proposed median as well as the scaled-back cliff. It’s hard to argue with the need to reduce hazardous rock fall in the Map Curve area, except to imagine a parallel universe where foresighted engineers had tunneled through Laurel Hill when the modern highway was originally built..! But alas, the current alignment is our reality, and based on the materials provided by ODOT, the scaled-back cliff is another least-worst solution for the problem. 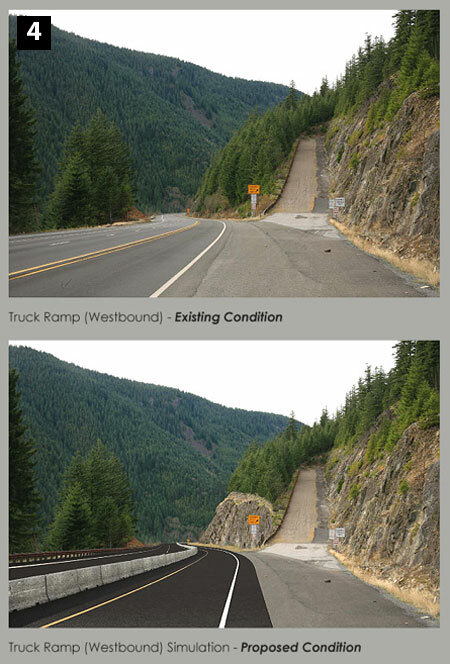 The engineers are proposing a steeper-than-standard cliff face when completed, but with a larger catchment at the base, thus (hopefully) reducing the number of rocks that make it to the roadway while also minimizing the amount of road widening to accommodate the catchment. 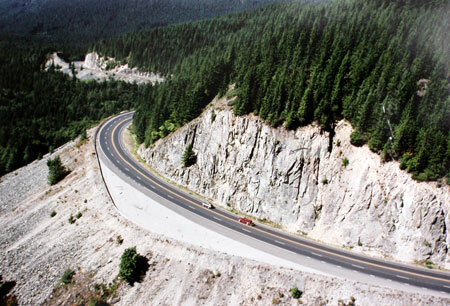 ODOT surveyed the existing cliff with the aid of a helicopter, and the scope of this element of the project is truly daunting: as shown in the image above, the man-made cliff is already very large, and making an even taller cut will be a tricky endeavor, indeed. This element of the project appears to already be a done deal, so the best we can hope for is that the resulting scars on the landscape aren’t any more jarring than what can already be seen (and heard) from nearby recreation trails. Keep your fingers crossed. The next rendering (above) is from a point just beyond the Map Curve, looking back at the curve and the adjacent runaway truck ramp (a feature that dates back to the late 1970s). As with the previous views, the changes here include the scaled-back cliff section and continuous concrete median. Next up is a before-and-after view toward the mountain from high saddle on Laurel Hill where the highway crosses from the south face to the north side of the ridge. This spot is familiar to travelers as the site of the historic Laurel Hill Chute interpretive sign and trail. 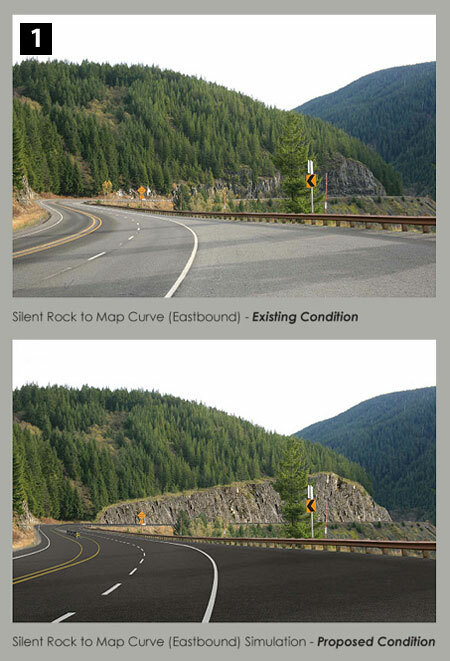 The rendering shows the proposed median, road widening to 4-lanes and another substantially scaled-back cliff section to address reported rock fall hazards. Notably absent from this rendering is a new pullout and trailhead for the historic Laurel Hill Chute site, hopefully just an oversight by the artists. ODOT has not suggested in the written materials for the project that trail access at this point will be eliminated. This is a detail worth commenting on if visiting this fascinating remnant of the original Oregon Trail is one of your family traditions. The next before-and-after rendering (below) is from the same section of road, also looking east, but from the bottom of an embankment on the opposite side of the highway, where the Pioneer Bridge Trail parallels the road. Here, a structural retaining wall is proposed to provide the additional roadway width needed to widen the highway to four lanes and add the center median. 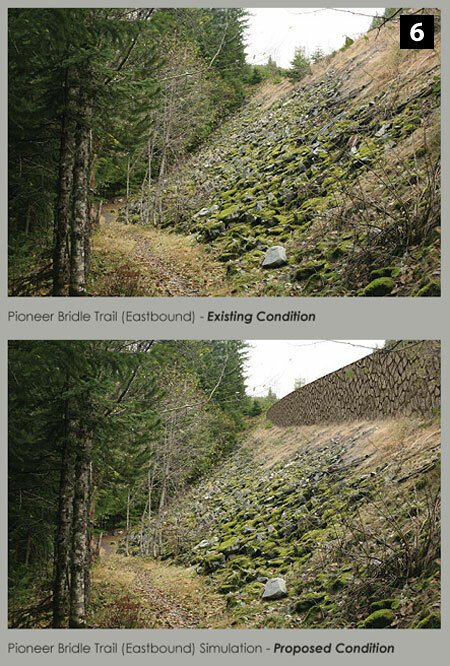 Kudos to ODOT for a context-sensitive solution with this retaining wall: the rendering suggests it will be constructed with faux-stone facing, thus lessening the visual blight for hikers, cyclists and equestrians using the trail, if not the overwhelming noise from highway traffic. The proposed widening to 4 lanes in this section is significantly scaled back from earlier incarnations of the Laurel Hill safety project. This is a welcome change to the design, as ODOT’s own safety data shows only occasional spikes in traffic volumes — on holidays and peak summer and winter weekends — that road widening would do little to resolve. Most of the time, traffic volumes on Highway 26 are far below built capacity, and the few (and arguably avoidable) traffic jams that occur don’t warrant costly widening projects. The final before-and-after view is from opposite the Mirror Lake trailhead, looking west (downhill) toward Laurel Hill. Here, the rendering shows another proposal to cut back an existing slope to address rock fall and sight distance concerns, the upper extent of the proposed median and another section of highway proposed to be widened to 4 lanes. The Mirror Lake trailhead is unquestionably dangerous, thanks to very heavy use and its location on a relatively steep curve. The proposed median will should eliminate the possibility of crossover crashes throughout its proposed 2.5 mile extent, but is especially warranted at this location. However, the median will also prevent left turns in and out of the Mirror Lake trailhead, forcing hikers approaching from Portland to continue west to Government Camp to make their return trip. With the median terminating just east of the trailhead, visitors will be tempted to make a U-turn, a potential hazard ODOT has not addressed in the proposal. Likewise, visitors coming to Mirror Lake from Government Camp will have to drive 3.5 miles to the bottom of Laurel Hill, and presumably turn around at the Kiwanis Camp junction in order reach the trailhead. These changes at Mirror Lake will be unwelcome news to hikers who have already chafed at the recent winter closure of the trailhead by ODOT. In the end, it’s probably a “least worst” trade-off in the interest of traffic safety, but ODOT could be doing much more to make this element a real step forward for Mirror Lake visitors. For example, it’s hard to tell from the “after” rendering, but the Mirror Lake trailhead appears unchanged: this is a missed opportunity, as ODOT will spend tens of millions on the overall Laurel Hill safety project, and a more carefully and aesthetically designed parking area here, separated from the highway traffic, could further improve traffic safety. 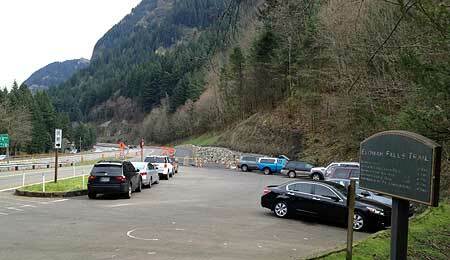 ODOT has a lot of recent experience in this area from their excellent trailhead parking improvements in the Columbia River Gorge, including Angels Rest, Horsetail Falls and Yeon State Park. 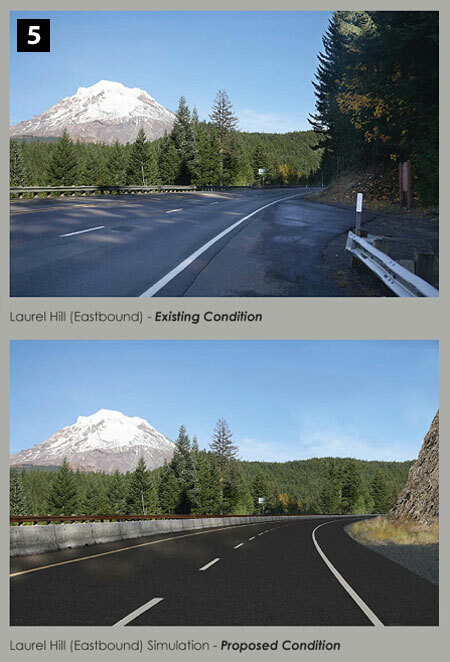 These relatively new designs provide a perfect template for the Mount Hood Highway, and follow the aesthetic lead ODOT has already taken in recent years with context sensitive designs for the Multorpor overcrossing and Government Camp signage, for example. 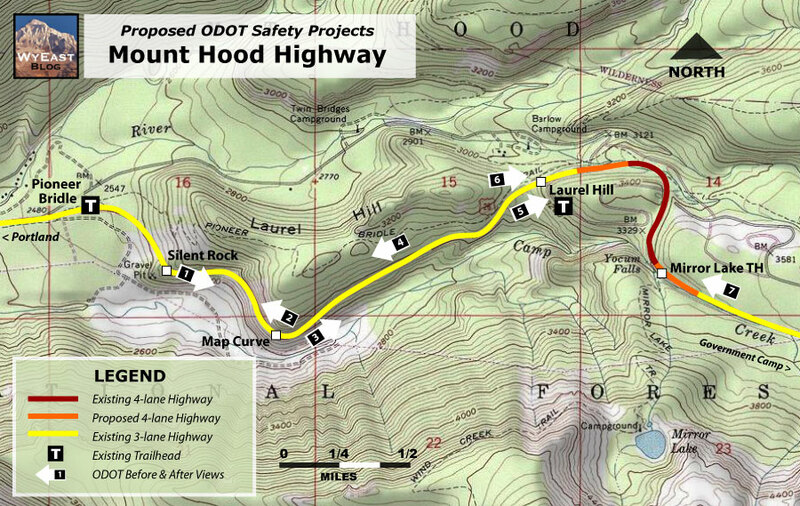 The current round of projects coming to the Mount Hood Highway are the most recent in a string stretching back decades, and clearly will not be the last. Though the final designs ODOT is proposing in the interest of “safety” are less destructive than some of the initial concepts, there are still a number of missed opportunities and questionable “solutions” on the table. It’s probably too late to turn back some of the more questionable elements, but there’s still time to advocate where opportunities have been missed. Here’s a rundown of some additions that could make this project more successful. Consider adding these to your own comments! 1. Retain the Laurel Hill Chute Trailhead: this important historic site has been a family stopping point for generations, and must not be lost to road widening. 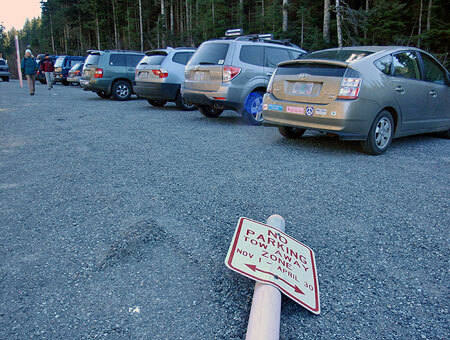 ODOT should propose an improved pullout for visitors at the current trailhead. 2. Make the Mirror Lake Trailhead a showpiece: ODOT should follow its own lead with new trailheads built in the Gorge, and make this trailhead more than just a dusty highway pull-off. Mirror Lake is the “gateway” trail for many first-time visitors to the mountain and the pullout and trailhead ought to be designed accordingly. 3. Use architecturally enhanced medians: the proposed exposed aggregate medians are a tiny step in the right direction, but this element of the project will be the most visible to the traveling public. Let’s aim higher with architecturally themed medians that coordinate with recent improvements to the Government Camp streetscape — and at a minimum, the capped design used at Bennett Pass. 4. Look for storm water solutions to protect Camp Creek: the project is silent about the ongoing effects of polluted Highway 26 runoff on adjacent Camp Creek, a salmon and steelhead-bearing stream. ODOT will be putting down an immense amount of asphalt and new road fill with this project, so will they also improve storm water capture in the process? 5. Don’t wait to install variable speed signs & photo radar: this is one of the least expensive solutions in ODOT’s own safety audit, but moved to the back of the line from the very start. Why wait? Install variable speed limit signs and photo radar now for use during hazardous conditions. 6. Extend the Highway 26 Safety Corridor: ODOT bravely reduced the posted speed limit to 45 MPH from Wildwood to Rhododendron in an earlier phase of the Highway 26 safety campaign. Now it’s time to extend this safety corridor to Timberline Road. It’s an inexpensive, extremely effective safety solution whose time as come — plus, reduced speeds greatly reduce noise impacts for those living along the corridor and recreating on nearby public lands, a dual benefit. Go ahead, weigh in… by April 7th! Remember, comments are due by April 7th! While it’s true that many of the project elements are likely a done deal, you can still have an impact by making your concerns known. Projects like this have a sizable “contingency” budget set aside for this very reason, and now is the time to guide how those funds (your tax dollars) are spent! Highway 26 Widening Postscript… and Requiem? This entry was posted on March 24, 2013 at 10:33 pm and is filed under Cultural History, Natural History, Proposals. You can subscribe via RSS 2.0 feed to this post's comments. Tom, I was wondering if you have any comments about today’s (March 26, 2013) photo #618 at Historic Hood River. 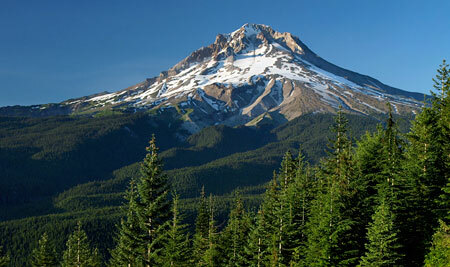 It deals with the establishment of the Oregon National Forest in 1918. By the way…..another excellent article with excellent photos. Thanks, Laurene – I’ll take a look at the new photo!